Last week we featured film-maker Bobby Easley at On the Beat with Bobby Easley and Brian Neal. Bobby and Brian were promoting their movie projects, The Devil Dogs of Kilo Company and Belly Timber. I have written about Bobby and these movies several times. I met Bobby at a Days event and I started following his work because it fascinated me. I don't promote him because he is a friend or because I promote Days of the Dead and other such events. I support Bobby because his movies are fantastic. I promote Bobby because I think my readers would like what Bobby creates. At the recent Days of the Dead, during our interview, I asked Bobby about who he wanted to meet at the event. He mentioned Haruo Nakajima, who had a table across from Bobby. 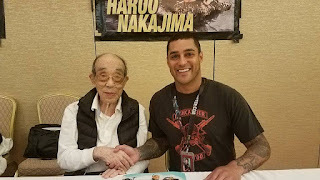 Nakajima, best known for portraying Godzilla from the 1950's through the early 1970's, was definitely a favorite of a lot of people at the Days event. It was cool to hear Bobby talk about his fandom and then to see him meet Nakajima. These are the kind of cool things you see at a Days event. Even the celebrities like meeting the other celebrities. That puts everyone in a good mood. I always encourage everyone to check out Days at DaysOfTheDead.net. I also encourage everyone to check out my interview with Bobby and to check out his projects! Haruo Nakajima and Bobby Easley in Indianapolis, IN-July 2017.